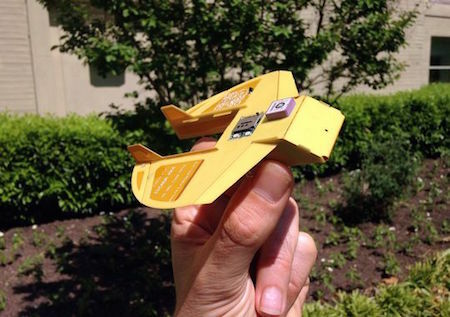 The Cicada (Covert Autonomous Disposable Aircraft) is a tiny UAV designed to be dropped in large numbers; it falls to earth within a few feet of a designated location. Muller saw a cloud-wrapped planet... it could have been Venus... The recording eye pierced the cloud layer and revealed an unfamiliar, not very Earthlike planet. Boardman said, "That was taken less than a month ago. We parked a drone ship fifty thousand kilometers up and dropped roughly a thousand eyes on Beta Hydri IV.